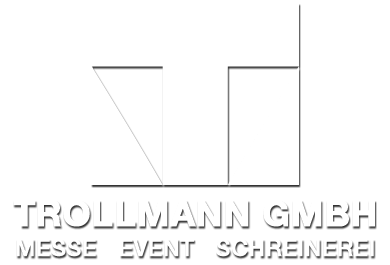 The Trollmann GmbH offers bespoke trade fair and exhibition concepts designed with passion and knowledge and realized in our own joinery – We are your full service partner for trade fair and exhibition design and construction. For over 70 years we have been listed as a qualified member of the Bavarian employers’ association of carpenters, specialized in trade fair and exhibition work. We have also been listed as a qualified member of the Bavarian employers’ association of joiners. Our family owned company has existed for more than 3 generations and offers consultation services, development, planning and realization of trade fair and exhibition design and construction in one. Regardless of the design solution you need, be it for tiny spaces or large trade fair construction, we are pleased to develop a surrounding for you that matches your individual expectations and requirements – in design, functionality and individual message. Our full-service approach guarantees that we and our service partners will personally take care of all of your demands and needs. There is no need for different companies and a long organizational process; we will arrange the whole event for you and guide you through the planning of your project. No matter if you need the design of a floor plan or individual light shows and sound systems – we are there for you. We use unique special materials as well as the latest multimedia technology, adapted to suit your personal needs. We also furnish your showroom or store, we design and build custom made furniture, stylish and functional. Or do you need support with your roadshow? The Trollmann GmbH can help you with all of these tasks. Come convinced of our individual solutions and our specialist advice and service. As a family owned company we are small enough to give personal advice, but large enough to make all your wishes come true. We look forward to helping you!